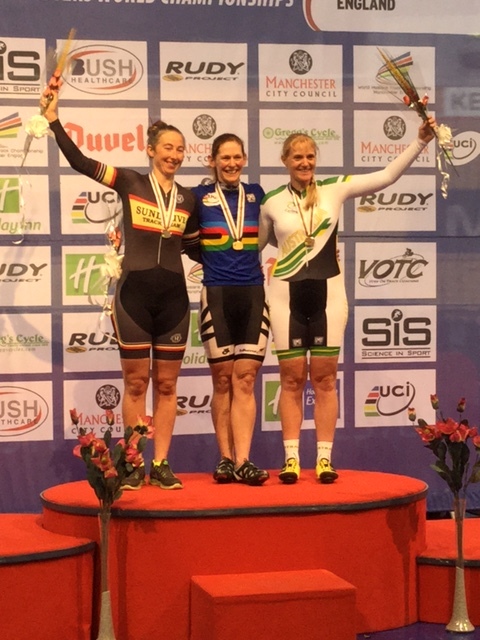 Our superstar lady has done it again - World Champion Individual Pursuit title holder Erin Criglington has defended her rainbow jersey in Manchester at the Worlds Masters Games. Check out her reports below. Day 2 at the velodrome is done and dusted. This morning we had the individual pursuit qualifying. I was up against Mel Symon form Australia, and managed to post a seasons best time of 2.34.629 to qualify fasted for the gold medal ride in the evening. The evening ride I was against Susie Mitchell from Ireland. It was a tough ride and Susie started fast, however I managed to pull her back after the first 500m and managed to hold on to the end from the fast finishing Susie. My time was 2.35.? Absolutely relieved and rapt to do the 3-peat! Bring on the rest of the week's racing! Well day one at the track is done and dusted. Today both Neil Familton and Grant Tyrrell had their scratch race heats. Both made it through to the final comfortably! The final was a fast race with with lots of breaks attempting to go. Grant ended up 2nd with Neil 16th. Both raced well and looked for opportunities as they arose. A good race by all. I had a short ride on the track this morning and after a couple of slow roll starts I decided It was better to avoid the traffic and do a recovery ride on the rollers. Accreditation and race packs were picked up so things are all go! After lunch in town we headed back to the track so Neil J could resume his roll as chief handler and mechanic. We decided to get there earlier than intended to avoid the crowds that would be heading to the Manchester City game that started at three. When I ducted out to the supermarket you could hear the crowd!! What a noise - you don't realise how passionate the English football supporters are. Not sure who won however I would think Man City scored at least one goal by the cheer that went up at one stage. Caught up with Carolien this afternoon. She is looking fit! looking forward to the team sprint later in the week. Not much else to report. Will look to watch some of the England v Australia game this evening. The build up is very do or die and a lot of hype given the closeness of it all and how much England needs the result in their favour.